Supposed to head for the famous Xiao Di Hokkien Mee after the previous stop at Chomp Chomp Food Centre in part of our Hokkien mee trail, however, the bad weather and traffic spoiled the plan and we missed the opening hours. So, we activated our contingency plan and ended at Yi Ji Fried Hokkien Prawn mee. 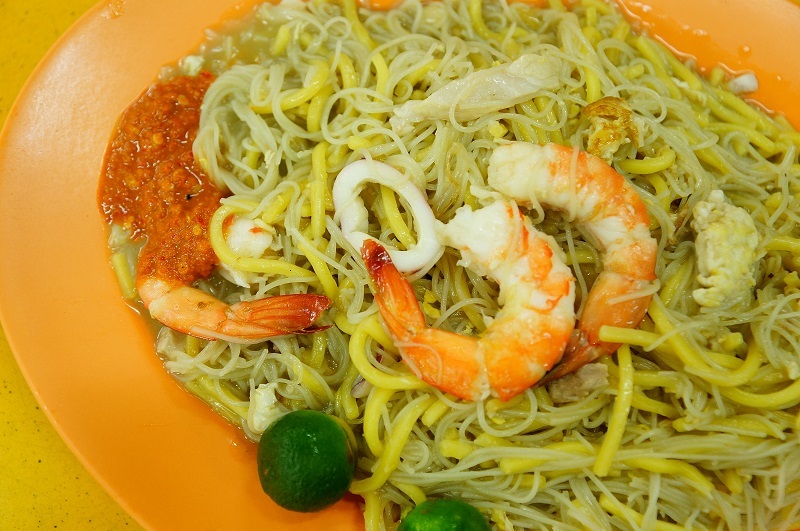 Yi Ji Fried Hokkien Prawn mee is located at Mee Sek Food Court (actually is a coffeeshop) along Upper Serangoon Road. 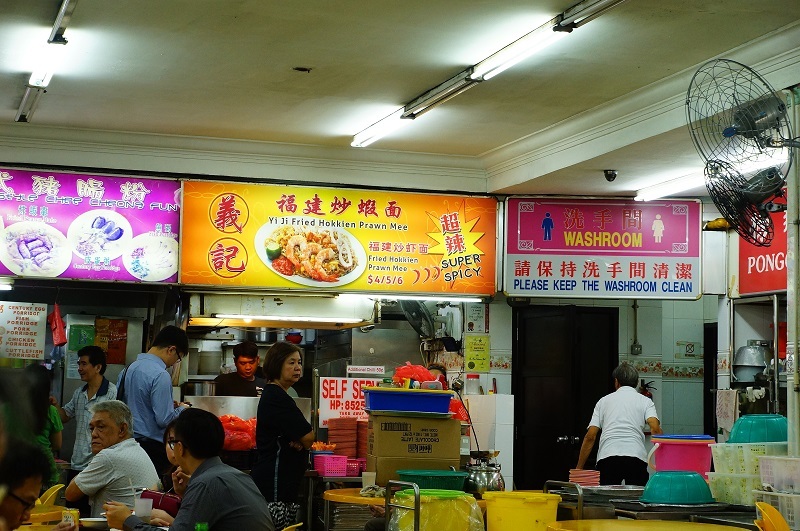 This stall shares the same premises with the famous Punggol Nasi Lemak. 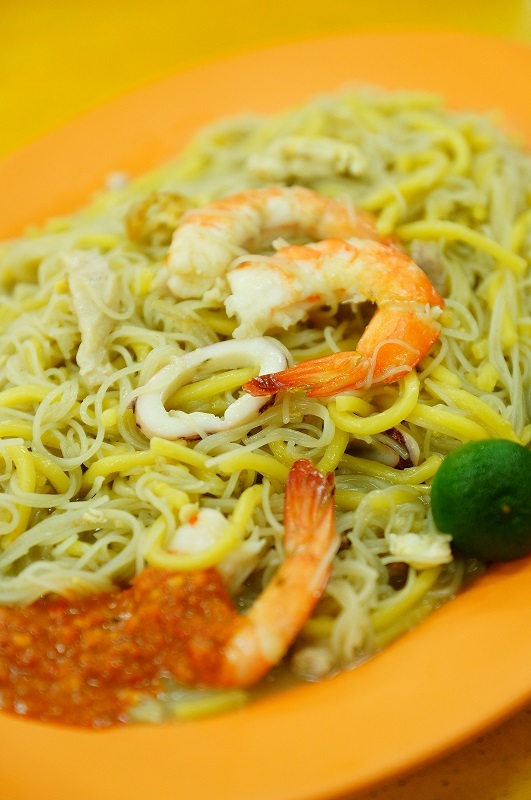 If you are looking a place for food after midnight around Serangoon area, Yi Ji Fried Hokkien Prawn mee opened from 5pm to 3am. The fried Hokkien mee comes in $4, $5 and $6, a big warning proclamation “Super Spicy!” is prominently displayed at the signboard, sound scarcely but challenging for chili lover. 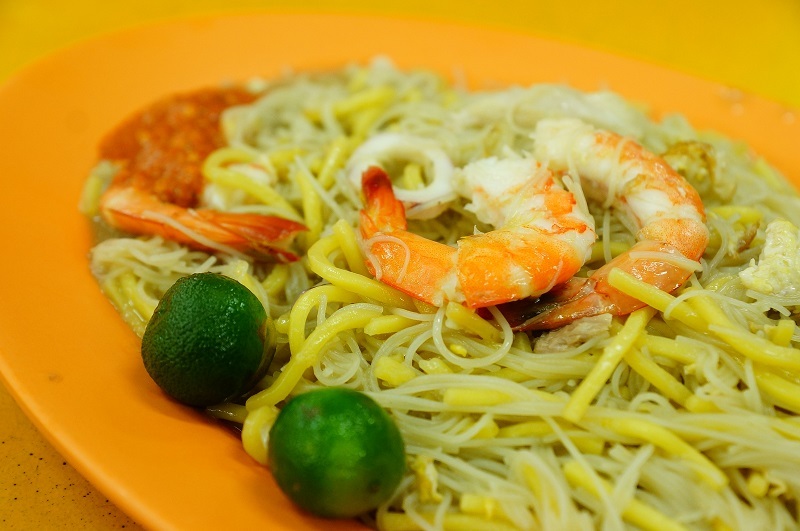 The plate of noodle was gooey, thin white bee hoon dominated the large portion in the plate with pathetic strains of yellow noodle buried in between the white bee hoon. The noodles were tasted a tab of sweetness, what you can taste was a plate of Hokkien mee with flavour that diffused from the pork belly and the stock added without the vital seafood flavour. If you love chili and the super fiercely hot chili, you will like the chili here, however, the chili was so fiery hot that it masked everything of the Hokkien mee, so hot that you can’t tell the difference if the mee is good or bad when you have it with this insanely hot chili. Looks like the chili come with a purpose as my taste buds were desensitized the ability for tasting any flavour completely. Our verdict, we wish Yi Ji Fried Hokkien Mee could be more flavourful, though this may seem to be wary if you go with the furiously hot chili. The excessive white bee hoon somehow also made the overall texture less satisfying to the taste buds. Overall, there is quite a bit of gap to our expectation. Good Service is basis and critical for F&B, sad to hear that you have bad experience with the stall.